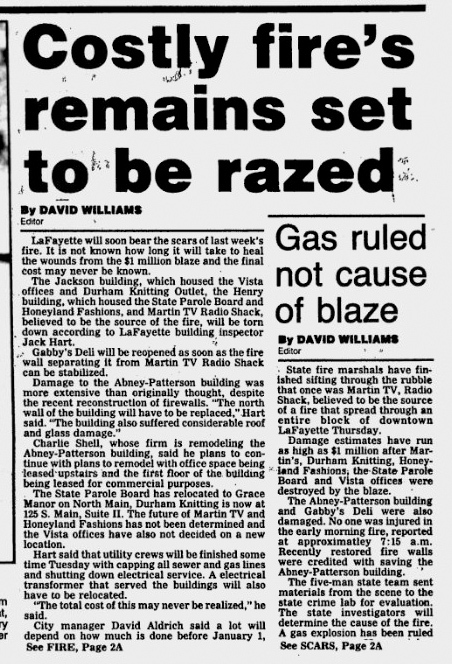 The Mars Theater fire last month brought to mind a much bigger LaFayette blaze some 21 years earlier. 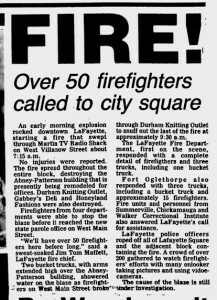 That fire, on September 27 1990, burned down almost an entire city block on the downtown square and involved firefighters from all over the region. 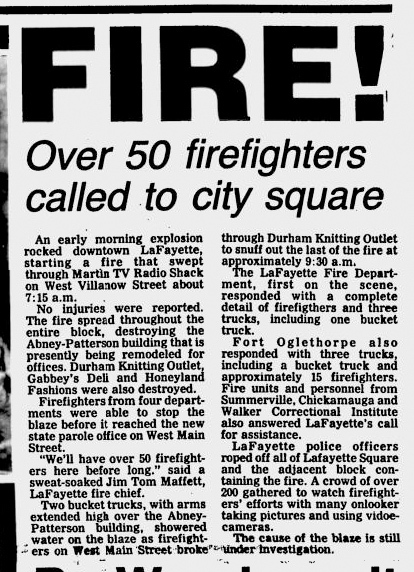 The fire began shortly after 7 AM on a Thursday inside Martin’s TV Radio Shack on West Villanow Street. Flames quickly spread to nearby buildings, putting at risk an entire block at the corner of West Villanow and Main. 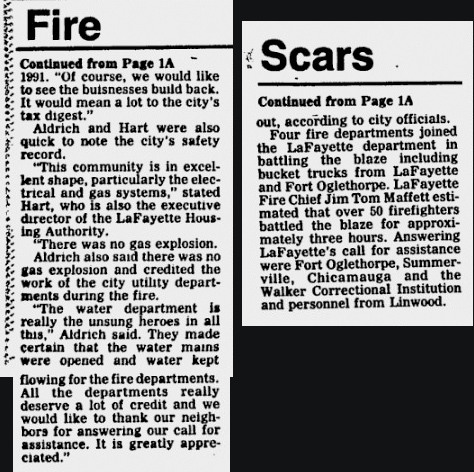 Fire crews from LaFayette, Linwood, Walker Correctional Institute (now Walker State Prison), Fort Oglethorpe, Chickamauga, and Summerville all responded, fighting the monstrous conflagration for over three hours as hundreds watched. Initial reports called the entire block a loss, but hard work from fifty-plus firefighters and recently installed brick firewalls left two of the five involved structures salvageable. The area still sustained over $1 million in damage. 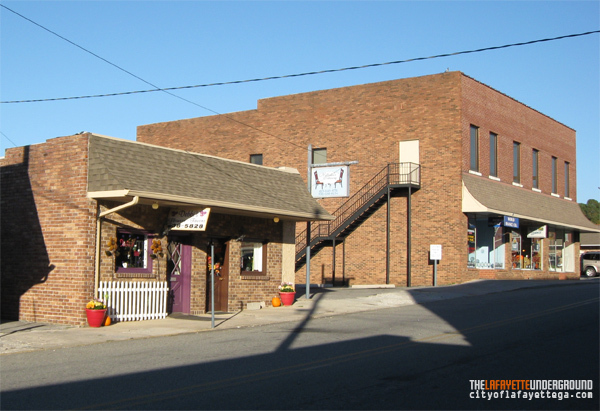 Before the fire, buildings on the block housed a variety of businesses and a government office. 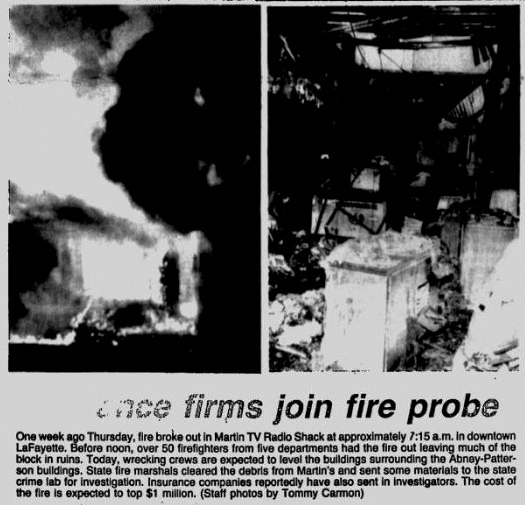 Martin’s TV Radio Shack was in a narrow building on West Villanow Street. Behind Martin’s, touching at the back, was a building containing retailer Honeyland Fashions and Georgia Board of Pardons and Parole. 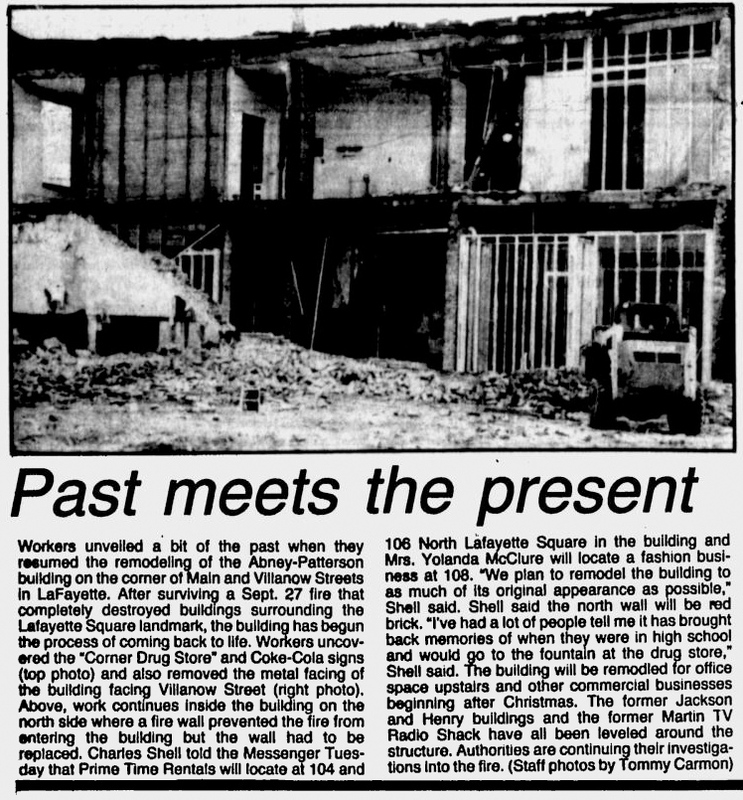 The structure next door had an outlet store for Durham Knitting Mills on the ground floor and an outpatient drug/alcohol treatment center, Vista, upstairs. State Pardons had an entrance on Withers Street facing LaFayette Presbyterian Church; the other involved businesses faced North Main Street. 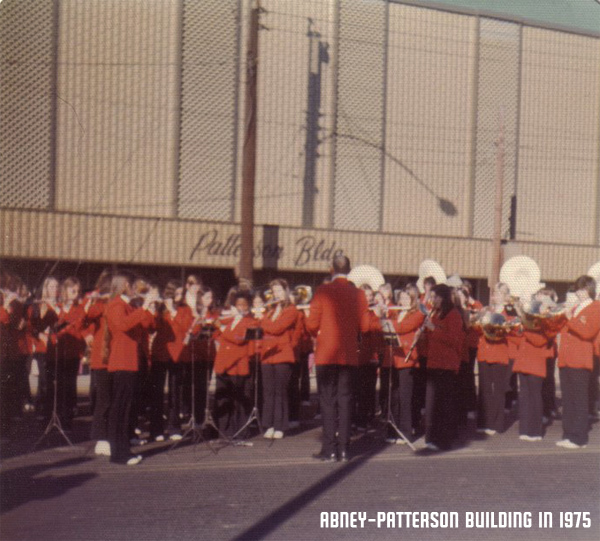 The Abney-Patterson Building (which had housed part of Abney’s Department Store until a few years earlier) dominated the corner and was surrounded on two sides by buildings that were destroyed, but managed to avoid catastrophic damage due to its firewalls. On the other side of Martin’s TV, Gabby’s Deli sat where Melinda’s Catering and Debbi’s Flowers are today. That building too was spared from major damage and reopened within days of the fire. 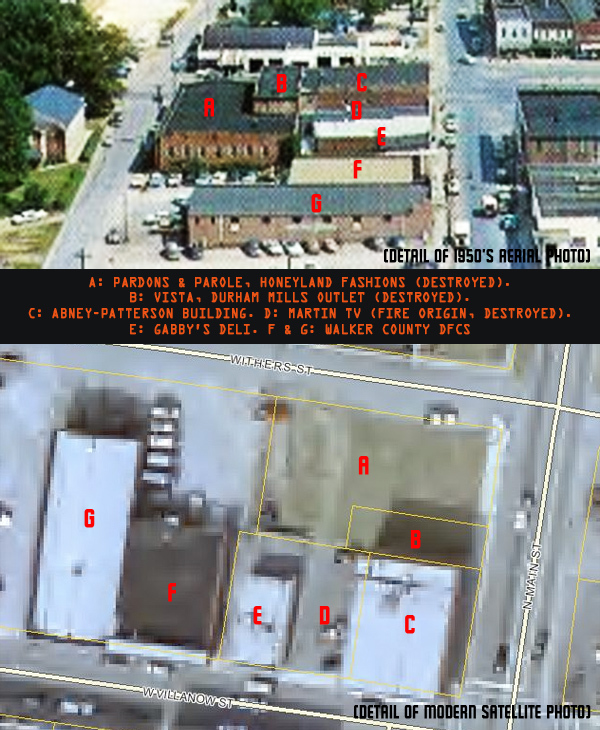 Walker County DFCS (where LaFayette Physical Therapy is now) was next door to Gabby’s but separated by a narrow alley. It was unaffected by the fire and moved to Rock Spring in the mid-90’s. 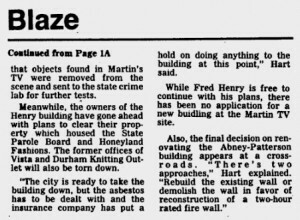 State Board of Pardons and Parole, Durham Outlet, and Vista all relocated to other buildings after being burned out. 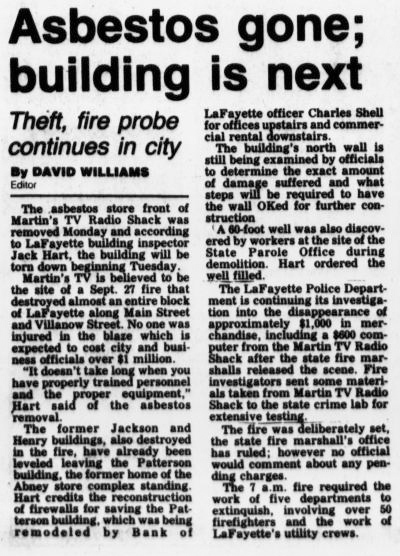 Honeyland and Martin’s TV never reopened, leaving LaFayette without a Radio Shack franchise until the current one opened next to Walmart in 2001. The three burned structures were deemed a total loss and – after delays to remove asbestos from the TV store and fill a 60-foot-deep well beneath the Parole office – were leveled. Charles Shell, owner of the Martin’s TV building, had the site paved to serve as a parking lot for his other properties, Gabby’s Deli and the Abney-Patterson Building, depicted below. State investigators ruled the fire an arson. Martin’s TV employees claimed several items had been stolen from that business and further reports pointed to a fire set there to cover up a burglary. 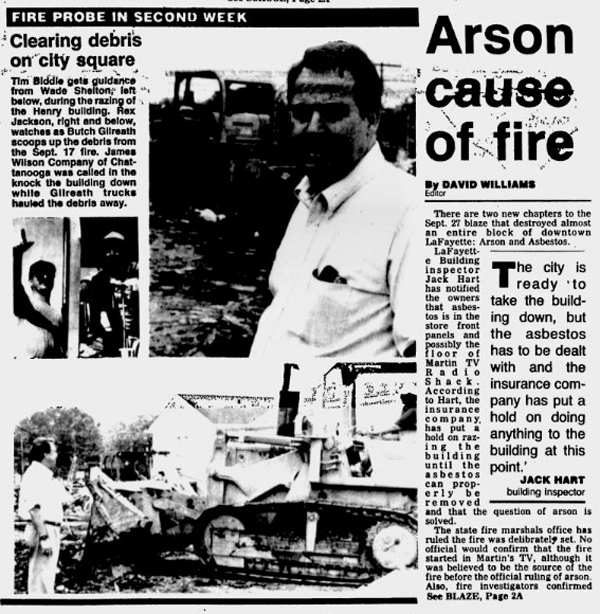 A careful search of newspaper archives well into 1991 found no additional mention of an arson investigation. There was apparently no suspect named and no charges filed in connection to the fire – making it a 21-year-old unsolved mystery. 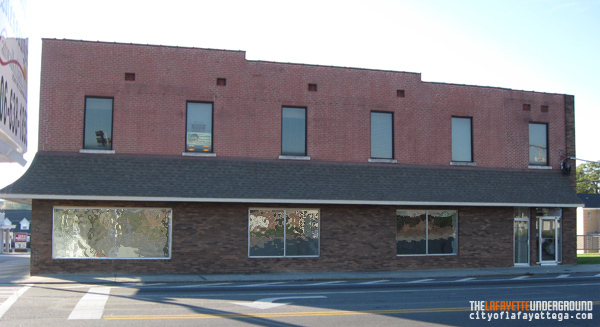 The Durham Outlet and Vista building belonged to Rex Jackson of Jackson Realty. 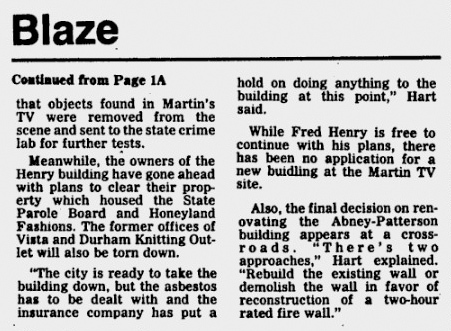 Jackson had bought the site a few months earlier, but after the fire sold it to Fred Henry, who owned the building where Honeyland and State Pardons had been. Both lots were cleared a few weeks after the fire, leaving a grassy lot on the corner of North Main and Withers. LaFayette Presbyterian Church obtained both sites from the Henry family in 1999, apparently planning to make them into parking for the church. 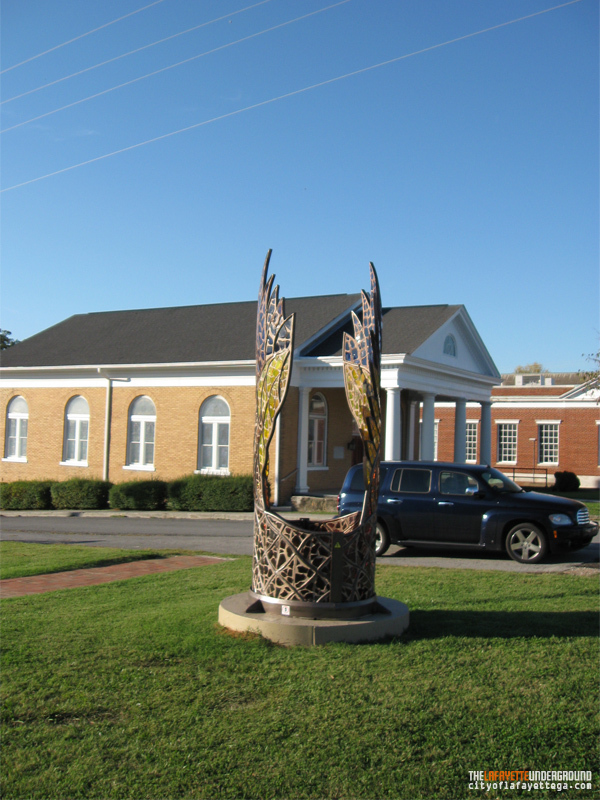 A parking lot never materialized and nothing was done with the site until this summer when volunteers from LaFayette Presbyterian and the city’s Downtown Development Authority shaped it into an art park with ornate glass sculpture “Enduring Trust” on prominent display. Abney-Patterson Building, which was being remodeled before the fire, sustained major damage to its firewalls and roof. The building’s northern outside wall, which now faces the park, had to be torn down and rebuilt before interior renovations could continue. The fire left an odd-shaped block at the corner of Villanow and Main, but the block’s appearance was greatly improved by breaking the Abney building out of its tacky aluminum prison. Pulling down ruined siding from the Abney building set off a wave of downtown improvements. In January 1991 every building on the West side of the square was covered with material that resembled trailer underpinning, but within a few months all were freed from the multicolor tackiness they had been violated with several decades earlier. Buildings on the East side of the downtown square had been spared from siding, but they had been painted a rainbow of colors ranging from off-white to bright blue. Within a few years almost all had been sandblasted and restored to their original brick surfaces. Improvements to downtown sidewalks, better lighting, and even trees soon followed. 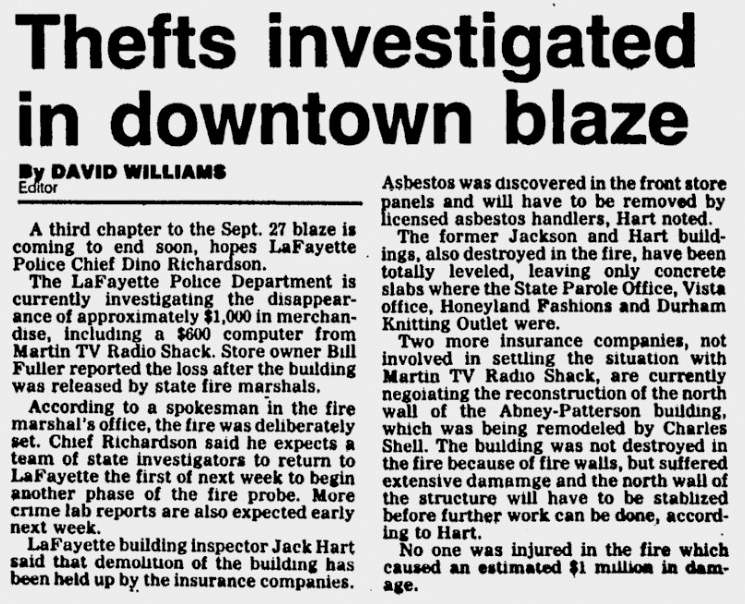 The September 1990 fire did a lot of damage, destroyed three buildings, closed two businesses, and took a lot of property off the city and county tax rolls – but all that was almost worth it to gain the partial restoration of buildings in the downtown area. The Abney-Patterson Building began its life a a drug store, and underneath the siding painted on original red brick were signs from that area, along with a Coca-Cola mural and other memories of the past. Older residents hoped the building would be restored to resemble its pre-60’s appearance, and the owner vowed to replace the damaged northwestern wall with matching red brick. Unfortunately that wasn’t done. 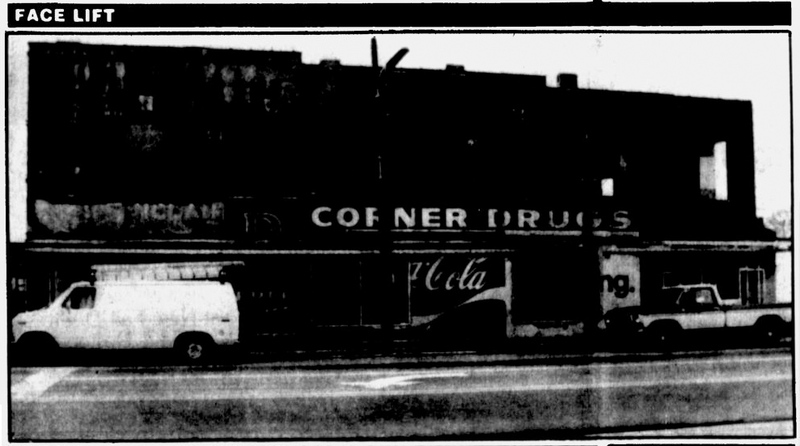 When renovation was finished, the Abney building had brown brick on its northern and western walls, and the same brickwork recovered the old drug store and Coke ads on Main and Villanow from halfway down. Only the upper sections of the southern and eastern walls were left with their original brick facing, and that didn’t exactly match the brown brick chosen for the other walls. That brown brick now looks somewhat dated, being the style of the early 1990’s – but it’s still vastly superior to the metal siding it replaced. 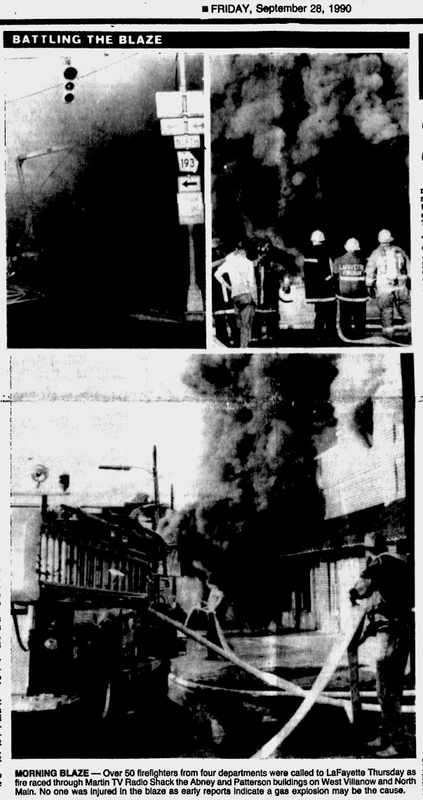 We looked for other period photos of the Abney building or others that surrounded it before the fire, but nothing was close enough to be usable. 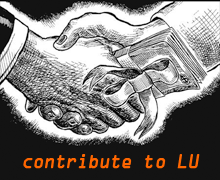 Friday Photos are becoming a regular feature of this site, but we still need your help to get historical local photos not available elsewhere. If you have a photo of downtown or anything else interesting from LaFayette’s past (or present) please e-mail it to photo@cityoflafayettega.com. No one has ever taken the time to correlate the concerned parties in common with questionable arson occurances over specific time spans, either.